Olivia Quigley was six years old when she suffered sudden cardiac arrest (SCA). She was in first grade, doing warm-ups in gym class, when she suddenly collapsed. Olivia’s story shows the best possible outcome for a pediatric victim of SCA. Witnesses saw her collapse, teachers began bystander CPR right away, and EMS arrived within minutes to take over. Her survival is a testament to how preparation can make the difference between life and death. But, sadly, hands-on practice for pediatric patients can be overlooked. People don’t like to imagine doing CPR on a child. The unpredictability of sudden cardiac arrest leaves witnesses paralyzed by unfamiliarity, surprise, and panic – and can hinder their willingness and ability to provide quality compressions and ventilations. 88% of pediatric OHCAs occur in non-public places.8 For those that are witnessed, many occur among young athletes. 1 in 70 high schools per year report a pediatric arrest.9 In all of these cases, witnessed or unwitnessed, providers are often ill prepared to act. Of the arrests that are witnessed, bystander CPR is only performed 35% of the time.10 Experts suggest that one way to improve pediatric survival rates is to build bystander confidence to take action. One study found that a one-hour crisis resource management training improved the trainees’ response time in the initial steps in a pediatric resuscitation.11 And, another study found that self-efficacy increased and anticipated anxiety about CPR decreased one month after parents received CPR training.12 This research highlights the impact that quality CPR training can make within a community. Reducing the fear factor means increasing survival. In order to effectively train community members in CPR and ensure that they will leave the classroom confident in their ability save a life, it helps to use more engaging learning methods. It’s been shown that learners achieve the greatest competency through interactive activities. Incorporating measurement, assessment, and feedback into pediatric CPR training can better prepare them for optimal performance, and can help you rest assured that you’ve just taught a class of future lifesavers. To increase SCA survival rates for children, training needs to be geared toward the people who are most likely to be with them – parents, teachers, coaches, and even children as young as 9-years-old.13 Engaging courses that provide the pediatric practice that these learners need are one way to make the training stick. What about EMS and Healthcare Providers? Training for the unexpected is one of the many benefits offered through simulation. This can be particularly true for healthcare professionals who are more likely to treat adult patients and are now faced with a pediatric patient in SCA. One study found that more than half of emergency medical services (EMS) providers see only one sick child in a month.14 This indicates that there is certainly a lack of real-life pediatric practice. EMS professionals training for pediatric QCPR. Why is this? According to Dr. Peter Antevy, many EMTs and paramedics have a tendency to automatically transport pediatric patients, as opposed to remaining to treat them on site as they would with adult patients. 17 When these first, critical minutes are used to transport patients, the chances of survival decrease. 18 This is precisely why training for pediatric victims is so important – developing the confidence and skills to stay put makes all the difference. It’s important to note that, even though pediatric in-hospital survival rates are improving, survival is still the exception to the rule. According to the American Heart Association (AHA), there is only a 36% survival-to-discharge rate for pediatric in-hospital cardiac arrests (IHCA).19 The majority of children do not recover, even with immediate attention from healthcare professionals. Research shows that only 10% of professionals achieve the necessary chest compression fraction, chest compression depth, and chest compression rate in a pediatric resuscitation.20 What all of this points to is the need for additional training – more specifically, training with a focus on high-quality CPR. Quality CPR for pediatrics is no longer a guessing game. With training manikins that provide immediate feedback and corrective guidance, professionals can feel confident that they are applying life-saving techniques. Pediatric cardiac arrest is unsettling and challenging to treat. Children are less likely than adults to experience cardiac arrest, but that shouldn’t create a void for pediatrics in CPR training. Instead, training for these low-frequency, high-acuity events should be made equally as important. By incorporating a pediatric manikin into your existing training curriculum, bystanders and healthcare professionals alike can improve their pediatric resuscitation skills. 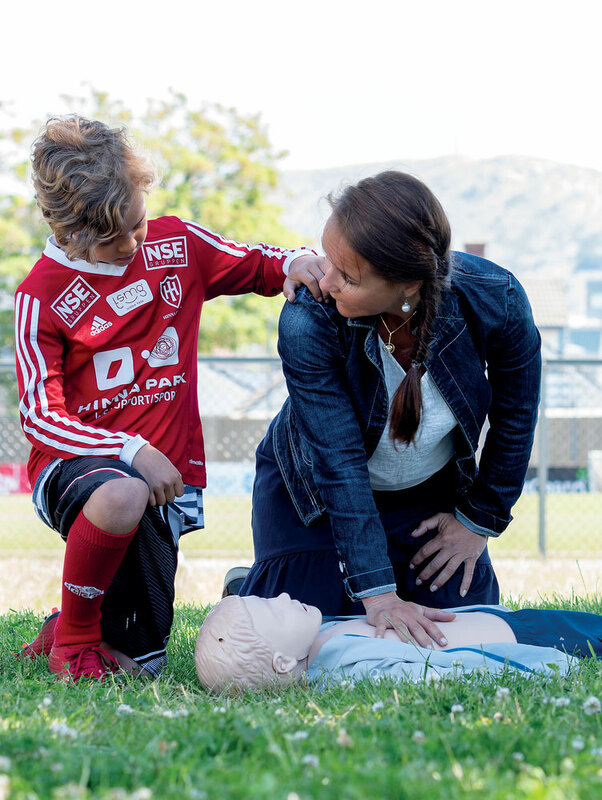 Laerdal Medical offers a range of pediatric CPR skills manikins that incorporate Quality CPR feedback and which will allow your learners to train to the highest CPR standards possible. Fuchs, S.M. (2018). See reference #2. Blackwood, J., Duff, J.P., Nettel-Aguirre, A., Djogovic, D., & Joynt, C. (2014). Does teaching crisis resource management skills improve resuscitation performance in pediatric residents? Pediatric Critical Care Medicine. DOI: 10.1097/PCC.0000000000000100.